On the morning of February 14, 2018 I was going to my friend's house to dog/house sit while they were gone for a few days. 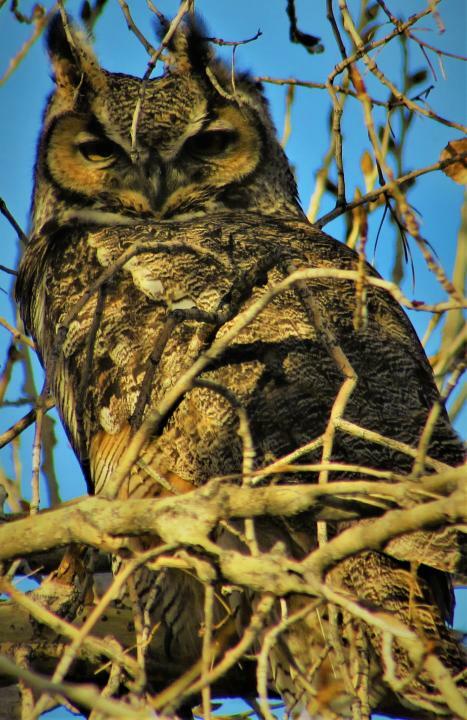 I heard a "hoot" come from the tree right next to the garage and looked up to see a male Great Horned owl perched in the tree. His mate arrived the next evening however after about 4 days the nest was blown apart by a heavy wind storm. I was able to enjoy them for a short time so that was a blessing. I used a Canon SX510; ISO 80; 1-250 sec. ; f/5.8; 129mm; 1430x2204.